The goals for column have been a real issue for Yeovil this term, as they go into the fixture against Luton on Saturday as the lowest scorers in League Two with just 33 strikes to their name from 34 games. However, that record disguises a pretty decent home return for the Glovers so far, conceding just 16 all season from 18 games, the same as leaders Doncaster and joint fourth best in the division. That miserly approach has seen Darren Way’s side win seven, draw six and lose five in front of their own fans, but it’s the two away victories that means they are 17th in the table, although some 11 points above the drop zone. A good spell during October and December saw Yeovil win seven out of 12 in all competitions as thoughts of a play-off push began to flicker, before results started to turn sour. In fact since hammering Crawley 5-0 on December 3, the Glovers have won just once out of 15 League Two encounters, that victory impressive in itself, seeing off promotion chasing Plymouth 2-1 on home soil in January. In that sequence, they also were thrashed 5-2 by Luton in the Checkatrade Trophy, but boss Way didn’t feel that result should be taken into account. He told the club’s official website: “I think we look at the last match and say it was probably the most under strength we’ve been in terms of team selection. “We had players missing and they went full-force against. Way tried to boost his goalscoring options in the recent transfer window, bringing in Owain Jones (Swansea City), Jean-Louis Akpa Akpro (Barnet) Kabongo Tshimanga (MK Dons) all on loan, although none of the quartet are yet to find the target. That has led to Yeovil drawing nine of their last 15 with five defeats too, with four goalless stalemates in there too, including the Glovers last two games. It means they have now gone three matches without a goal, over five hours of football and on his side’s struggles to pick up victories, Way added: “We have to make sure we win games. “We need to look at that on Saturday. “The last home game we won against Plymouth was a very good game. Unfortunately, we then drew two games where we were that close to winning. Team news: Luton are almost at full strength with just Danny Green (leg) and Cameron McGeehan (broken leg) missing. Lawson D’Ath, Ollie Palmer and Stuart Moore come back into consideration after being cup-tied for the Checkatrade Trophy semi-final defeat to Oxford on Wednesday night. Top scorers: Hatters - Danny Hylton (20). Glovers - Francois Zoko (10). Man in the middle: Darren Handley. Taken 31 games so far this term, showing 108 yellows and two reds, his last game the 1-0 win for Morecambe over Grimsby on Saturday. Refereed Luton twice last term, the 1-1 draw against York, plus the 1-0 defeat to Stevenage, giving a controversial penalty to the visitors which proved to be the winner. Prior to that, took Hatters’ 1-1 draw at Cheltenham in January 2015, Shaun Whalley on target. Officiated Town three times in their Conference winning season, a 7-0 hammering of Hereford, plus the 1-1 draw at Chester and 2-0 defeat at Wrexham, sending off Alex Wall with 10 minutes to go. Also had the whistle for the 5-1 defeat at Gateshead and 2-1 win at Hyde in the 2012-13 campaign, plus Luton’s 3-0 defeat to Forest Green Rovers in March 2012. The assistant referees are Louis Marks and Andrew Quin, with Adam Matthews the fourth official. In charge: Darren Way, 37-year-old, who began his career with Norwich City, but failed to make a first team appearance at Carrow Road and on his release, signed for Yeovil in the Conference in 2000. Was a firm fans favourite at Huish Park, leaving in January 2006, to sign for Swansea City for a fee of £150,000, before returning to the Glovers in 2008, before joining permanently once more, as he retired in 2010, having played over 200 times. Quickly became the club’s new first team coach and after five years in the role, briefly acting as assistant manager too, Way was appointed interim manager following the sacking of Paul Sturrock in December 2015. After impressing in the role, he was officially appointed as Yeovil’s full time manager later that month. View from the opposition: Darren Way talking to the club’s official website: “We’re in a better position than last year but are we where we want to be and do we want to keep drawing games? No. “But it’s not for the lack of trying. We’re all trying to build the club back up to where we belong. It’s not going to happen overnight. Friendly faces: Hatters boss Nathan Jones moved to Yeovil in 2005 after leaving Brighton and spent seven years with the club, playing over 200 games, including captaining the team at Wembley for the League One play-off final. Became first team coach with the club’s Ladies team, before promoted to player assistant manager alongside Terry Skiverton and switched to first-team coach when Gary Johnson took over, leaving in June 2012 to join Charlton as U21 boss. Glovers midfielder Alex Lawless, 31, spent almost six years at Kenilworth Road after joining from York City in November 2010, racking up 203 appearances and scoring a number of crucial goals in his tally of 22. Wasn’t offered a new contract in the summer and signed a one year deal at Huish Park, playing 32 times so far. Defender Alex Lacey came through the ranks at Luton, playing 51 times, scoring once, before he joined Yeovil in 2015 and has played 60 games, scoring two goals. Striker Francois Zoko also had a trial at Luton when John Still was in charge, but moved to Yeovil. Played for both: Centre half Ryan Inniss, 21, played three times for the Hatters after joining on loan from Crystal Palace in January 2014, scoring on his debut in the FA Trophy at Cambridge United with his first touch. Had spells at Gillingham and then Yeovil from October 2014 to January 2015, where he featured six times. Went to Port Vale and joined Southend in the summer, playing nine times in total for the Shrimpers, sent off in the 2-1 defeat at Gllingham on Saturday. One to watch: Francois Zoko - 33-year-old striker who is the Glovers’ top scorer this season with 10 goals in all competitions. Started at Carlisle, scoring 25 goals in two years at Brunton Park, before spells with Notts County and then Stevenage. Played for both Blackpool and Bradford, while had a trial with Luton under previous boss John Still, but wasn’t taken on permanently. Snapped up by Yeovil on a free in November 2015 and has scored 18 goals in 58 games so far. We’ve got form: Hatters have only made two trips to Huish Park in their history, as prior to last season’s defeat, the only other visit was a 0-0 draw back in League One in October 2007. 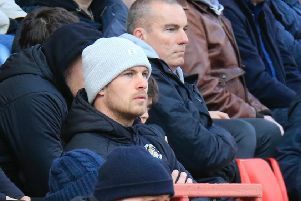 Current Town boss Nathan Jones was part of the Glovers side that day, as was ex-Luton loanee Lloyd Owusu too. Last time out: Luton contrived to throw away a 2-0 lead to lose 3-2 at Yeovil Town last season. Hatters went ahead through Craig Mackail-Smiths’s superb volley on four minute, with Paul Benson’s (19) close range volley making it 2-0. Stephen Arthurworrey pulled one back seven minutes before half time, while Ryan Bird came off the bench on the hour to score on 62 and 73 minutes for the hosts. Hatters: Mark Tyler, Scott Cuthbert, Scott Griffiths, Steve McNulty (Mark O’Brien 45), Luke Wilkinson, Jonathan Smith, Cameron McGeehan, Ryan Hall (Alex Lawless 58), Danny Green (Paddy McCourt 66), Paul Benson, Craig Mackail-Smith. Subs not used: Elliot Justham, Stephen O’Donnell, Pelly-Ruddock Mpanzu, Josh McQuoid.